The fascist architectural style that dots the city is certainly a jolt from the Medieval and Baroque structures that seem more in tune with L’Aquila’s culture, yet its historical presence intrigues me. It seems more out of place after the earthquake, and I wonder if residents resent its apparent resilience. The black and white postcards used here are my own purchased from delcampe. I snapped the photos. I’m not an architect, historian or photographer- just a curious traveler. I’ve spent considerable time exploring the EUR (left) and other bastions of fascist era buildings in Rome, so when I noticed this genre in L’Aquila, I wanted to learn more. Naturally, no buildings in L’Aquila are as imposing and grandiose as those in Rome, but the style is unmistakable and integrated into the city. 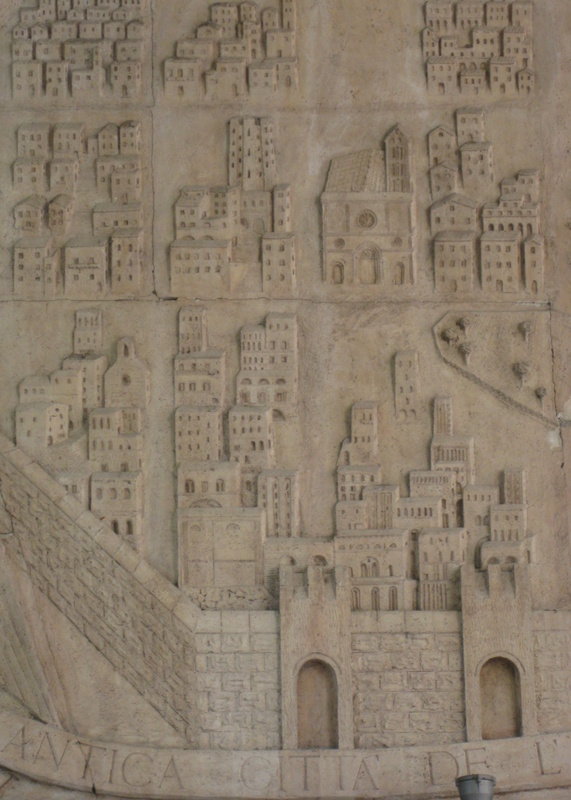 To fall in line with regime vision for a New Italy, it was essential for L’Aquila to evolve into a modern city and gateway to tourism with a future beyond sheep farming. 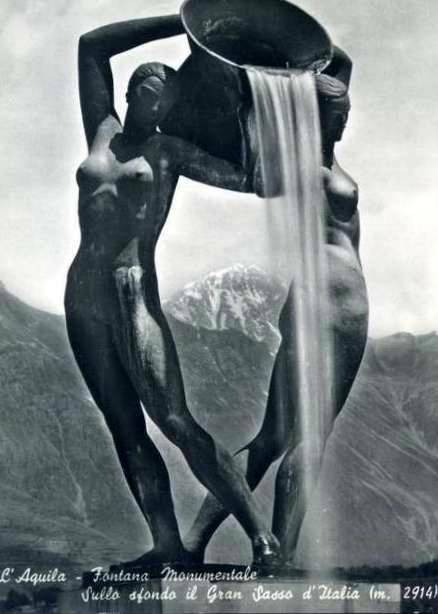 Consider the idealism in this 1934 postcard of the Fontana Luminosa sculpted by Abruzzo born Nicola D’Antino. You may recognize the iconic conca- the copper water basin that village women skillfully balanced on their heads to transport water from the village fountain to the home. Clearly stylized as comrades, these identical nudes provide a sumptuous invitation to ski and trek through Gran Sasso which lies invitingly behind them. 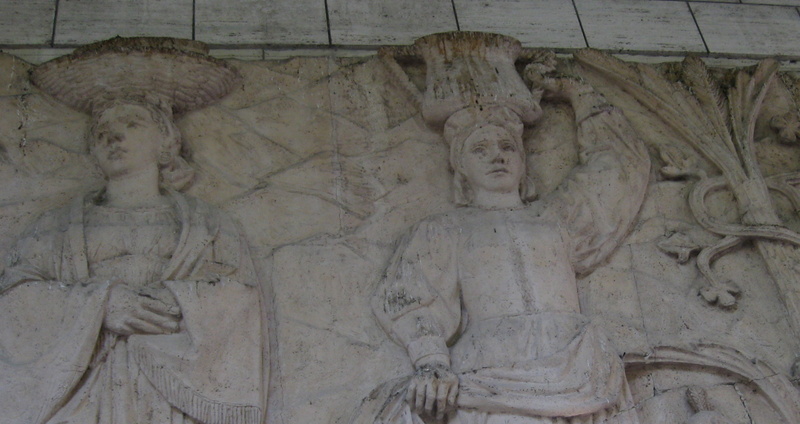 I want to note here that architects and artists who were commissioned to design buildings and sculpture did not necessarily adhere to Il Duce’s ideology. Additionally, other artistic phases influenced the times- Modernism, Rationalism and Art Deco are in the mix in 30’s Italy. L’Aquila born Adelchi Serena is not an artist. Holding various political positions including the National Fascist Party Secretary, Minister of Public Works and Mayor of L’Aquila from 1926-34, he spearheaded the effort to bring L’Aquila into the New Italy. 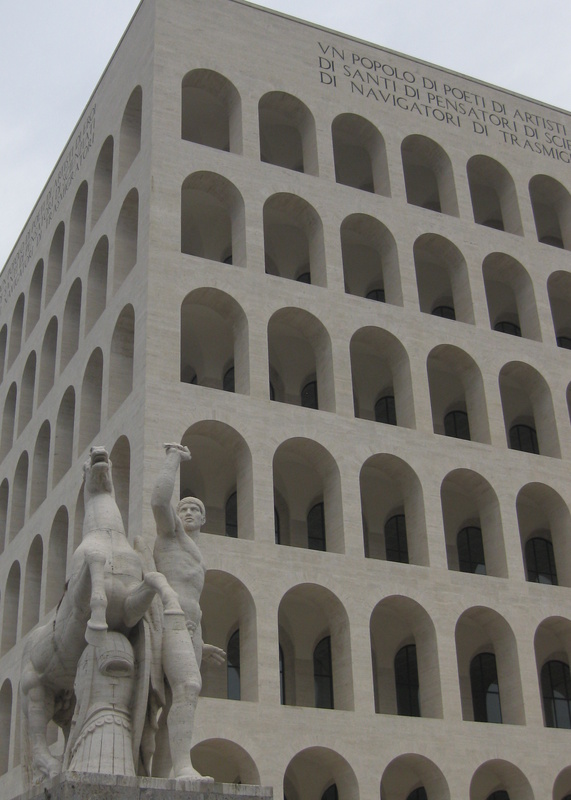 The tenets of fascism –efficiency, progress, a nod to the glorious Roman past with a face forward to a modern Italian future – could be visualized in Serena’s push to construct new buildings. Here are some examples of glorious modernity from two buildings on Corso Federico II. 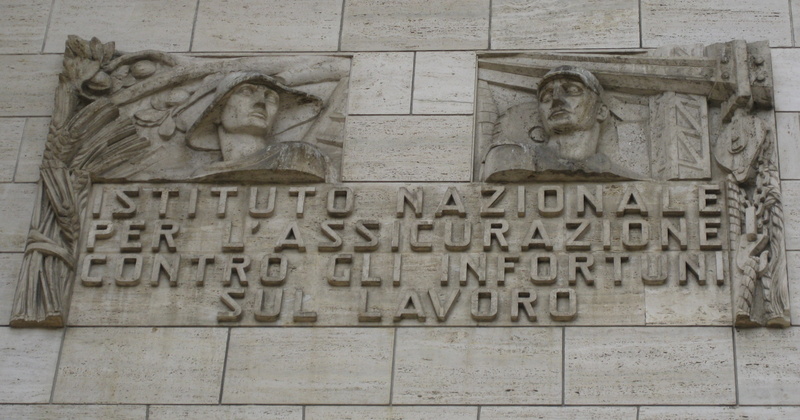 Just below, The Istituto Nazionale Infortuni sul Lavoro (1940) was demolished in November of 2012. 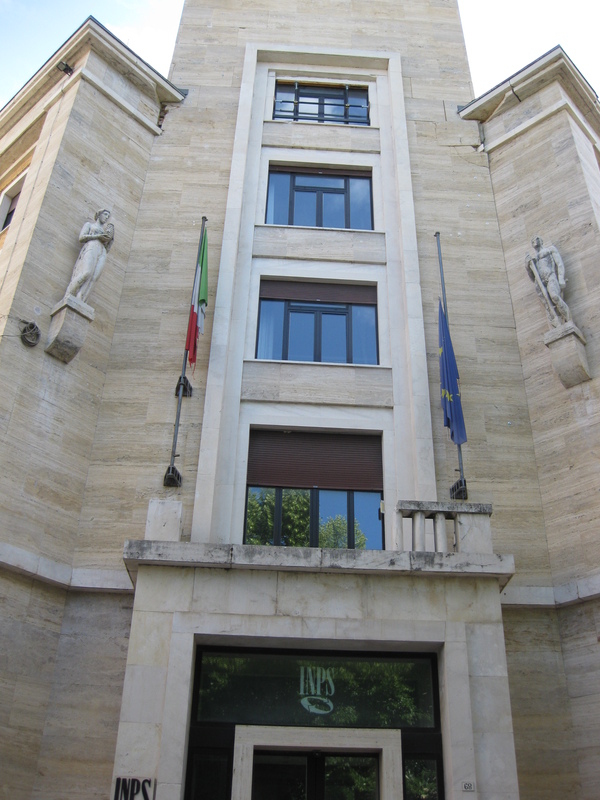 Following is the Istituto Nazionale Previdenzia Sociale. Fascism emphasized health and fitness. 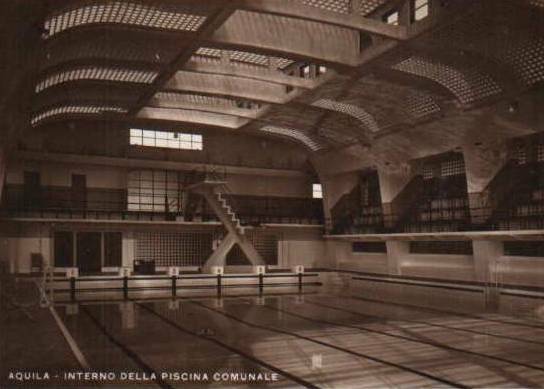 This state of the art pool in L’Aquila facilitated the physical training the regime demanded to secure a disciplined and competitive generation. The pool is named for Ondina Valla an Olympic medalist in track and field who brought home the gold to Italy in Hitler’s 1936 games. Though born in Bologna, she lived in Pettino just outside of L’Aquila from 1954 until her death. A good deal of information about Serena can be found in on Roberto Alfatti Appetiti’s blog post titled Adelchi Serena, the fascist who transformed L’Aquila. Concerns about just how steeped in fascist principles Serena was cost him full honors for his modernization efforts. Reviewing a biography of Serena, Appetiti notes that a plaque bearing Serena’s name hangs at the pool entrance, but the facility is named for Ondina Valla. Here is an example of the red brick and travertine wrapped windows characteristic of the fascist style. 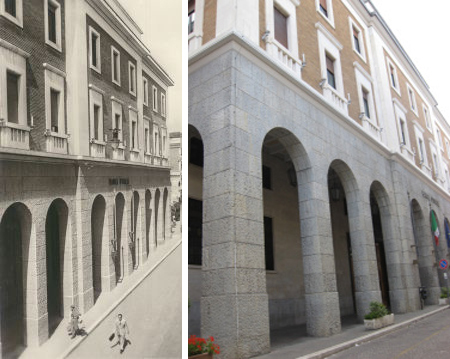 This is the Banca d’ Italia then and now. 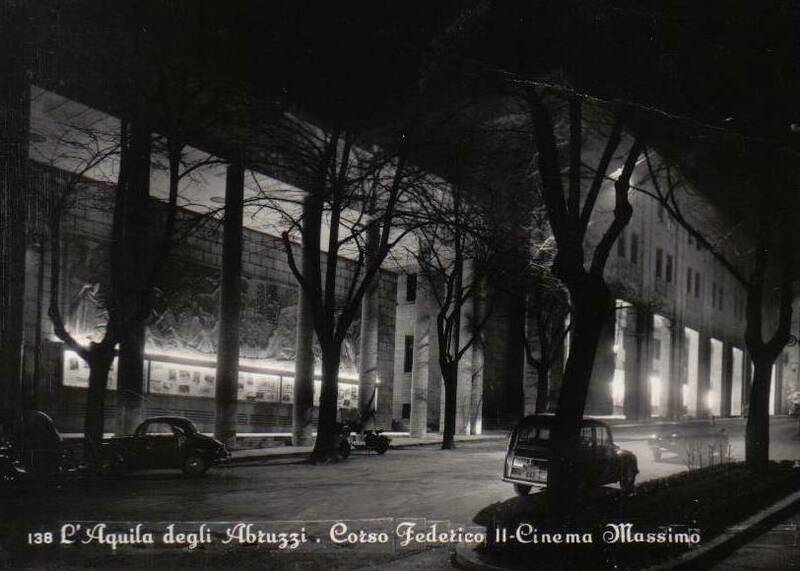 My favorite era fascista building on Corso Federico II is the Cinema Massimo. The fascade is forgettable, but the terracotta bassorelievo is spectacular. If the figures seem oddly warm and humanized, it’s because the three scenes are a reproduction of a relief from the ancient city walls. 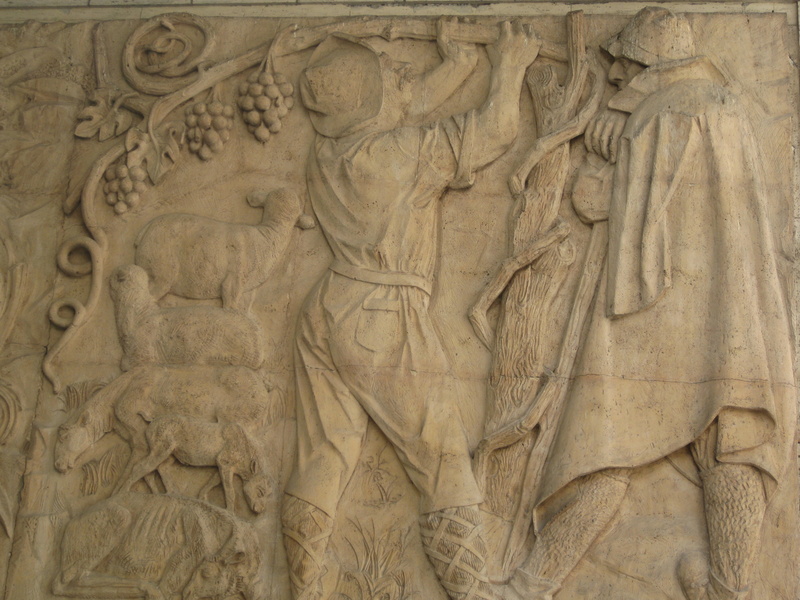 You can see the walled medieval city grid, the detailed dress, cesto and conca of two rural women, and a cloaked pastore engaged with a grape grower. Seen from a fascist perspective it hails city planning and labor. Nonetheless, the relief redeems the dead style of the building. Or maybe trumps it. For those who know more about era fascista style in L’Aquila or Abruzzo, please share. Corrections welcome, too. End note: Adelchi Serena ,Il Gerarca Dimenticato by Walter Cavalieri and Francesco Marrella looks like a good biography and taps into the mixed feelings residents have about the past. Tagged: Abruzzo, Adelchi Serena, Cinema Massimo. Abruzzo, Corso Federico II, era fascista, Fontana Luminosa, L'Aquila. Hi there…I really enjoy your blog. We share a love of Abruzzo. I’ve nominated you for The Very Inspiring Blogger Award. http://majellahomecooking.com/2013/03/07/inspired-thanks/ No rush or obligation to pay it forward. Look forward to reading more from you. Ciao! Thanks, Michelle! I have “improvements” in the works. I think that the award is a lovely thing to do in this sometimes lonely world of personal blogging. Nice way to make it more of a community. Helen! Do you know I only just discovered that this was your blog by reading through some comments? Even more wonderful! I need to make some more “improvements” myself. Could use Sammy’s expertise! I’m also holding out hope that I’ll be able to attend “Let’s Blog Abruzzo”….if my new cooking classes go well, it just might happen! A presto! Ha! Well then we know there was no bribery involved. Let me look into your cooking classes. See if I can drum up some students. We are lowering the price as very soon because we signed a sponsor who can pay our speakers. Hope to meet you soon. Abbracci.